A brave panel tackled the topic, Compensation: The Difference it Makes, at the Corporate Directors Forums I attended in San Diego last month. Like all Corporate Directors Forums, this one operated under the Chatham House Rule, so you will not find any direct quotes below. These are my notes on Compensation: The Difference it Makes. As such, they include my opinions as well observations made by speakers panelists and others in attendance at the Forum. This is certainly not a transcript. However, I hope even those who attended the Forum will find the post useful, especially my attempt to provide additional context through links and commentary. 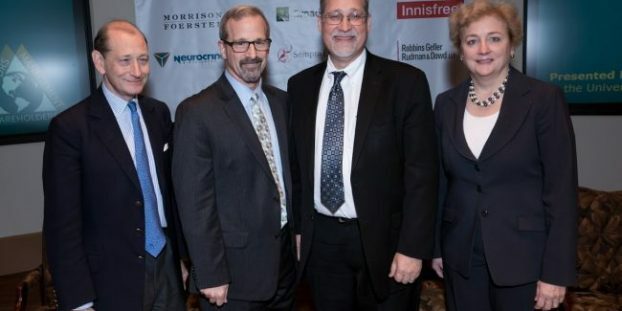 To learn more about the Corporate Directors Forum, click on the following: @corpdirforum on Twitter, tweets from #CorpDirForum2018 that often link to other posts, website, and Linkedin. Tax act bonuses are gaining popularity for sharing benefits. However, some employees in high tax states will be losers because of the loss of ability to deduct all state and local taxes. Companies could do tax planning to keep employees so they don’t move to lower tax states. 162(m) changes mean companies will include more in taxable income. Shareholders may react but performance-based compensation is expected to continue. Expect to see salaries increase. Positive and negative performance measures. See Bloomberg Tax and brief from Bryan Cave LLP. Pay ratio reporting will be a big deal. It will be geometrically more challenging than say on pay. Expect increasing use of qualitative metrics in pay schemes. Shareholders are expanding definitions of risk. What companies do with their tax money will be highly visible. Peer vs internal pay comparison. Expect more gaming of peer group. How does it impact company if pay escalates based on peer comparisons? Employees will get upset. Peer group vs internal model. The ball is in the court of institutional investors but they are used to peer group comparisons. I do not see them moving to the more inward looking model advocated by Elson. Triangulate pay internal, peer and what we can afford, that is a reasonable approach for many. Expect a moderate increase in CEO pay. Recruiting and attracting resources. What are others using? Most usually follow the herd. Impact of pay ratio rules. Expect a process of engagement for those out of line. It may be a shock and awe for the general public, since most do not seem to have a clue how much CEOs at major companies earn. I would expect a public backlash. There may even be some internal negative reaction re pay. Local newspapers will pick up on significant disparities. Companies may need to raise employee pay or reexamine compensation packages. 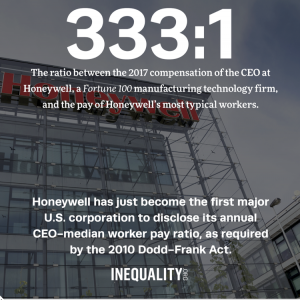 The first major corporate disclosure has just come from Honeywell, where the median worker made $50,296 last year. And Honeywell CEO Darius Adamczyk? He took home $16.5 million in 2017. The highest ratio disclosed to date is Del Monte’s, which is reported at 1,465:1. CEO pay came in at $8.5M, whereas median employee was $5,833, 80% of the total employee population are from Costa Rica, Guatemala, Kenya and the Philippines. Others argue that employees already know what CEO gets paid. Yes, there will be media storm. Shareholders set the agenda. Companies need to set the narrative or shareholders will. Numbers will change perceptions. Say on pay has been phenomenal in increasing dialogue. It did not hold pay down but it certainly did increase communication. Say on pay was a net positive for comp committees to sharpen their focus. Now maybe it is becoming more of a compliance routine. Companies that want to do something different could get hurt. Maybe for some smaller companies say on pay should be every other year vote. Some thought changes to 162(m) will provide a real opportunity re what pay for performance measures will be used going forward. There was also some discussion around trends in director compensation, which most seem to agree is more competitive than CEO pay. Restricted stock encourages good long-term culture. With pay ratio reporting and elections, expect to see a lot more charts like the following outdated Credit Suisse Report. Many concerned with compensation discparities will be pointing to the fact that average wealth in the United States is right up there with rich countries like France and Italy at $301,140 per adult. But, the wealthy 1-2% skew the averages. 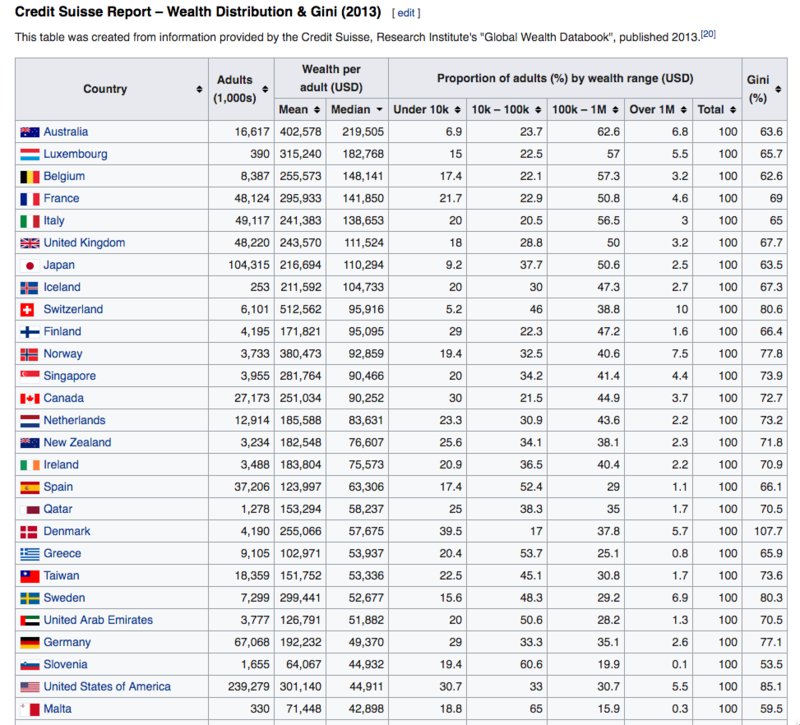 Look at median wealth per adult. In France it is $141,141, while in the United States it is $44,140. Yet, the average French employee works 311 hours less per year. (Average annual hours actually worked per worker) Most Americans have less wealth than Greeks, less than Slovenians. Will they view it as a problem? Henry Ford recognized that we would be better off if he paid workers enough so they could buy Ford autos. It is time to learn from history? 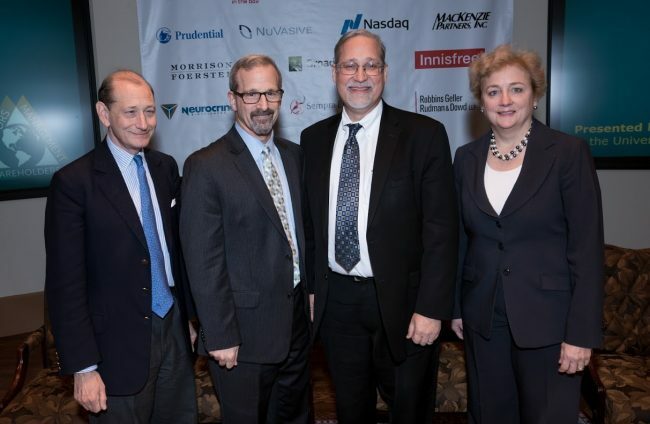 Note: Photos by Bob Ross, courtesy of Directors Forum 2018.